Tommy Whitelaw is one of the UK’s most effective and influential campaigners for people with dementia and their families. For many years, Tommy had a successful career in the music industry, where he worked with the likes of Kylie Minogue, the Spice Girls and U2 in merchandising operations. But in 2007, his mother, Joan, was diagnosed with vascular dementia and he gave up work in order to care for her. Despite his heartfelt love for Joan, Tommy found the day-to-day experience of care incredibly difficult. Understandably, it was a dark and difficult time, and Tommy became increasingly lonely and isolated as he battled against the complexities of the health and social care system. 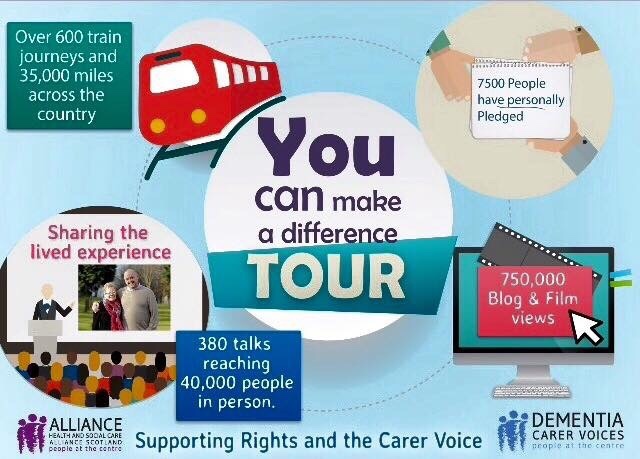 Tommy believed there had to be a better way: and he set out to make a difference for the thousands of carers like himself. He started a blog and a campaign, not to raise money, but to raise awareness among professionals, politicians and wider society. In 2011, he walked across Scotland, collecting the stories of other carers like himself. These stories are deeply moving in their selflessness, generosity, and compassion. But they are also testimony to the many unnecessary struggles that drain carers of time and energy which would be better focused on their loved ones. In 2014, he presented many of these stories directly to First Minister Nicola Sturgeon. As a result, many Members of the Scottish Parliament made personal pledges to tackle the problems associated with dementia care – from the invisibility of family members, to the lack of support in rural areas, to training for student nurses, and the specific needs of veterans. Tommy is now a project engagement lead at the Health and Social Care Alliance’s Dementia Carer Voices Project, where he uses these stories to help professionals focus on the people, not the disease. The Open University has developed several modules which help students to understand and respond sympathetically and appropriately to the particular issues which dementia presents. We have benefited tremendously from Tommy’s insights, and he has used videos and lectures to open our students’ eyes to the experience of caring for someone with dementia. Today there are more than 850 000 people living with dementia – one in fourteen people over the age of 65. As the population ages, it is predicted the numbers affected will rise to more than a million in the next ten years, and two million by 2051. Or, to put it another way, we will all know someone affected by dementia, and many of us will need to grapple directly with the emotional and practical issues involved. Each of us therefore has a vested interest in ensuring that every single person affected by dementia – both living with dementia and their families – is treated with the respect and dignity that they deserve. Tommy’s work is helping to make that a reality. It is an honour to thank him on behalf of all our students who have benefited from his work, to acknowledge his commitment to this vital cause, and, of course, to remember his beloved mother, Joan. 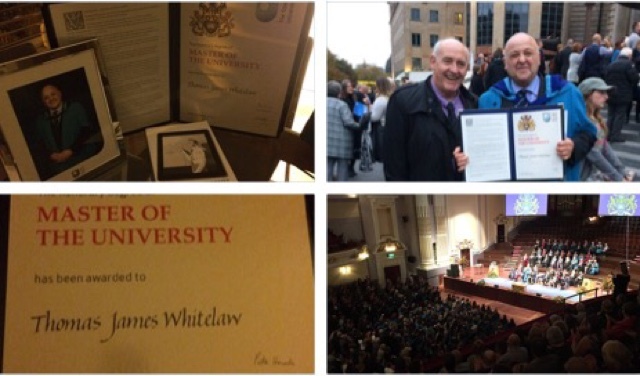 By the authority of the Senate, I present to you for the degree of Master of the University, Tommy Whitelaw. 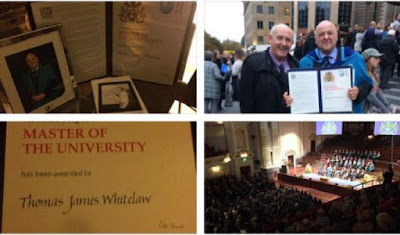 Tommy Whitelaw, Project Engagement Lead for Dementia Carer Voices and long-time campaigner has been awarded an Honorary Master of the Open University for his exceptional contribution to the education of health and social care workers, managers and policy makers on the needs of people living with dementia, their families and carers. Tommy’s campaigning journey began in 2011 when he undertook a walk round Scotland’s towns and cities to collect hundreds of life story letters from individuals caring for a loved one living with dementia. Tommy was caring for his late mum Joan, who had vascular dementia and felt passionately that no one should have to face the confusion, loneliness and isolation that too often becomes part of the caring experience. Tommy presented these letters at the Scottish Parliament to ensure that real people’s experiences are at the heart of the decision making process. Since then, he has engaged with thousands of carers through his ‘Tommy on Tour’ blog and as Project Engagement Lead with the Health and Social Care Alliance’s Dementia Carer Voices Project, conducting frequent talks to health and social care professionals, students and carer organisations across Scotland and indeed the UK to raise awareness of the impact of dementia on people and families, and the importance of empowering carers in carrying out their difficult but vital role. 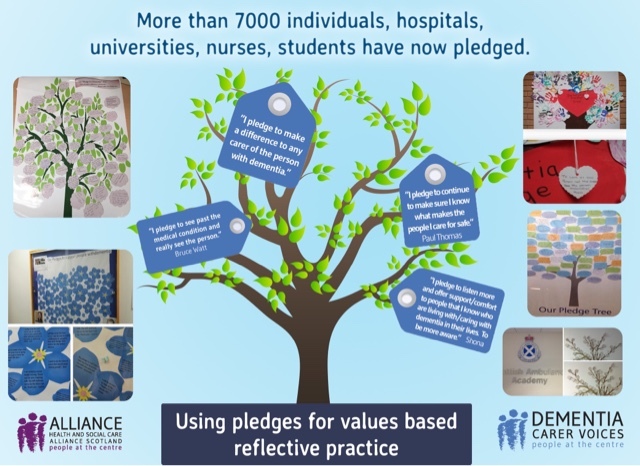 He and the team have also made a series of videos which have been used as key learning resources by the Open University, with many students also attending Tommy’s educational seminars to really embed the importance of genuine person centred care. The team are incredibly proud of Tommy for this incredible achievement, and for the work he does on a daily basis. We would like to say a huge congratulations to Tommy for what is a truly outstanding accomplishment. “I’m really privileged to receive this Honorary Master of the University from the Open University. Arriving home from a talk and receiving the letter the day after my mum’s birthday was particularly special. The work we do is really based on people and relationships, so I would like to dedicate this to my mum, and my friend and colleague Irene Oldfather’s mum, along with my colleagues Laura and Sarah, and Joyce Cavaye for the nomination. “I first met Tommy in July 2011, a few months after my mum had died. I was at that time promoting work on the Charter of Rights for People with Dementia that I had started in Parliament. I recognised a kindred spirit. Within the sadness of Tommy’s story, there was an enthusiasm and determination for change that can only come from the journey of loss that dementia can be. I say loss – but somehow even within and around that deep daily loss is something that cannot be broken even by dementia – unconditional love. The privilege of caring – a special smile, a small gesture – even when communication is gone, a meaningful shared look can and often does, say it all. And you think – how lucky am I – how lucky am I to have today, with this wonderful amazing beautiful person who did everything for me – my mum? I don’t think anyone in Scotland has done more to raise awareness and to campaign than Tommy and it is right and fitting that those efforts have been recognised in his Honorary Degree from the Open University.